Welcome to my April 2017 Monthly Income Report! As always, I create these reports to share the latest happenings with my online businesses, including the wins, the failures, the lessons learned, and the income generated along the way. If this is your first time stumbling upon these reports, check out the income report page to see my income history dating back to October 2008, which is when I first started to monetize a website (InTheLeed.com then; now GreenExamAcademy.com) dedicated to helping people pass an architectural industry exam. Since then, I’ve created many more websites, brands, and products ranging from courses to software to books. And, as always, I’m happy to share the inside scoop on what I’ve learned so you can be better prepared for your own online business journey. Without further ado, here’s the April 2017 report. As shared in last month’s income report, March was an all-time record month. The total profit was $212,117.33—a 74 percent increase from the month before. What accounted for the huge boost? The launch of two brand new online courses. Smart From Scratch came out of its beta period and experienced its first public launch, and a beta version of Power-Up Podcasting was sold on stage at a live event. Smart From Scratch and Power-Up Podcasting are the first two courses I’ve ever produced for the Smart Passive Income audience, and the experience definitely verified what everyone else has been saying about online courses: they can be extremely profitable. More than that, though, the results I’m seeing from existing students is unlike anything else. New businesses have been formed (some already having their first set of customers), and new podcasts are already up on iTunes. The month of April was all about taking care of the new students, planning for future courses and launches, and reflecting on exactly what took me so long to do all of this. Let’s start with that last point. The feedback and the praise I’ve received for putting these courses together, and holding people accountable, confirms that this is something I should have done much earlier. It took me eight years to finally start producing my own online courses. I had a lot of mental roadblocks to overcome. The biggest one was this: Because I was already making good money by providing free content and generating significant affiliate income by promoting other people’s products and courses within that content, I thought that adding my own courses on top of that would come across as greedy and unnecessary. I had spent so much time building trust and credibility with my audience, I didn’t want to risk compromising that trust simply because I knew these courses could sell. I knew these courses would make money, but I didn’t want that to be the primary reason for selling them. That was huge for me to realize. Courses helped me, and I knew then that courses I create would help others too. Now I’m even more driven to keep going down this route. As with most things I’ve been doing online, I only wish I started sooner, but you can’t kick yourself for waiting too much because there’s nothing you can really do about it. You cannot change the past, but you can change what you do now and into the future. Speaking of the future, as a result of these successful launches, my team and I got together to plan launches for the rest of 2017, and well into 2018 too. More on those courses later. For now, another thing that’s been working well for me is live video. Specifically, something called #AskPatLIVE. As you likely already know, I have my main podcast, The Smart Passive Income Podcast, which publishes one new episode per week, and a secondary podcast, AskPat, which answers a voicemail question from my audience every weekday, five days per week. To help promote the podcast, I decided to experiment with a live version of the show called #AskPatLIVE, which I ran on a Friday at 1:30 p.m. PT on my Facebook Page, just to see what the feedback was, and to get my feet wet in the world of live streaming. During the hour, I answered several questions that came in, but it also gave me an amazing opportunity to ask questions back and receive immediate feedback on a number of different ideas I had. To sum it all up, the experience was amazing, and I’ve been consistently coming back every Friday at 1:30 p.m. for #AskPatLIVE and have made it a regular show each week. I used to do more live streaming, especially back when Periscope had first launched. But most of my streams back then were sort of random, not planned out very well, and didn’t do more than just be an amazing way to connect with my audience. That’s obviously very important, but in April I became very interested in finding out how other people were integrating live streams into their business in a more purposeful manner. Live streaming is becoming a major component in people’s businesses. Chalene Johnson, for example, uses live streams to help her repurpose content onto other platforms. In a podcast episode on the Social Media Marketing Podcast titled Facebook Live: Fuel All of Your Content with Live Video, Chalene walks you through exactly how she plans her content and starts with live video, but turns that into a podcast episode, a blog post, social media content, and more. Live video, for her, is her primary content platform. Other people, like Amy Porterfield, have discussed how going live during a launch to answer specific questions that your “fence sitters” have can be the difference between a sale and a pass on your next offering. I recommend listening to her recent episode about Saving Sales and Rescuing Refunds where she talks more in depth about this strategy (and several others) to make sure people buy and stick to your courses. Influencers like Michael Hyatt have been creating live streams to serve up valuable content as well, but also to help promote new items to his audience, such as his brand new Full Focus Planner, which just finished a massive pre-sale offer. I also know many others who use live video as a way to provide controlled access to Facebook Groups that they own. This is an amazing way to engage people in a community you already have, but in a controlled, “on my time” sort of manner. These are all inspirational, and I look to be incorporating a mix of the above strategies into my business. But there was one discovery I learned about that sealed the deal for me in terms of why I should be doing more live video, and it relates back to the courses I’m offering now and in the future. When you go live on Facebook, you can track to see who is watching and who is most engaged with your videos. Let’s say, for example, you have a course about fly fishing, and you go live on Facebook to teach a brand new technique you’ve learned. It takes about ten minutes to show, and it’s awesome. You don’t sell or pitch anything on this particular stream. Not only is this video content helpful (so helpful that a few people share it with their fishing buddies too), but you’re also able to track who has watched most of it. When you create an ad on Facebook for your Super Awesome Fly-tying Course, you can target, specifically, those people who have watched 50 percent or more of your video. You can target those who watched 75 percent with a different ad. By using live video to introduce yourself and turn cold viewers into warm leads and potential customers, you’re more likely to convert someone on the other end. And the beauty of all this is that it was a ten-minute video that you created on the fly (see what I did there?). The production isn’t expected to be perfect (because it’s live), and you’ve helped a ton of people. Do you see the power behind this strategy? Instead of spending money and sending Facebook Ads to people blindly, show them to those who you know would be interested in and benefit from the quality of content you can provide for them. If you’d like to learn more about Facebook Ads specifically, I’d recommend you listen to the latest episode of the SPI Podcast with Rick Mulready, who is my go-to expert when it comes to anything and everything related to Facebook Ads. So yes, I’ll be doing more live videos, and I’ll be doing so in a big way. In April, I decided to explore the option of having my own studio—a space away from home that is specifically built for live streaming and video production. With more courses coming down the line, it made sense to me to invest in a space that could be set up in a way where I could literally just walk in, hit broadcast or record, and just go. The lighting, the cameras, the software, it would all be ready for me. I ran some numbers and explored the plan moving forward this year and into the next, taking into consideration all that might happen if I were actually to get an office space of my own and do this, and all signs definitely pointed to “yes.” So, at the end of April, I’m happy to say that I signed the lease to a new office space that will become SPI Production Headquarters! I’m working with a team over at LiveStreamingPros.com to help get it all setup properly, and my videographer Caleb and I are totally stoked about the possibilities. I’ll definitely keep you posted and share a video walkthrough of the space, as it’s getting setup, and of course afterwards. But you can look forward to more from me, both in the world of live video, and courses (both free and paid) from this point forward. Okay, I know you’re curious. Let’s get into the income breakdown for April 2017. At the end of April, I had the pleasure of being invited to Tennessee to meet and hang out with Michael Hyatt, his team, and a few other amazing people for a much needed rest and relaxation retreat. We stayed at a place called Blackberry Farm, and I must say, I’m in love! For three days I spent time in nature in the Smoky Mountains with a little bit of masterminding and business conversation in between, but the best part was that I had a lot of time to myself to reflect. I thought about the amazing journey I’ve had, and I listed out all of the things in my life that I’m grateful for in a journal. I meditated by the lake and also spent a lot of time focusing on where I wanted to take things from here. Grow every day. That’s something I’ve been trying to do this year, through reading, through reflection, meditation and journaling, but most of all through connecting with other amazing people. I had the honor of being invited to Blackberry Farm here in Tennessee to join @michaelhyatt, @rayedwards, @sallyhogshead and several others to grow personally, professionally and spiritually together. I’ve had an amazing time so far, and will remember this trip for the rest of my life. I also look forward to coming back with my family and team sometime in the future because there are so many amazing new and fun things to do here. It’s our last full day here today, and I look forward to coming back home to San Diego soon a better and more inspired father, husband, leader and learner. Tennessee, you’re pretty special. ????? I also spent a lot of time with Michael Hyatt, and that time will never be forgotten. It’s interesting, because every time we hang out, I seem to pull so much inspiration from him. He’s sort of become a virtual mentor of mine. Back in 2012 when we first met, I learned how much of an effect his team had on his business, and it was from that experience that I finally began to start building a team of my own, which has been life changing. This time, I got to know him and his family more, some of whom were there. I got inspired to make sure I keep my family a top priority, even as I continue to grow my business and get older in life. It’s obvious how much Michael values his family in his life, and he’s been able to build an incredible business, change the lives of people around the world, and yet still has an amazing relationship with his wife and kids. I admire and am inspired by that, and hope to have the same when I’m older. 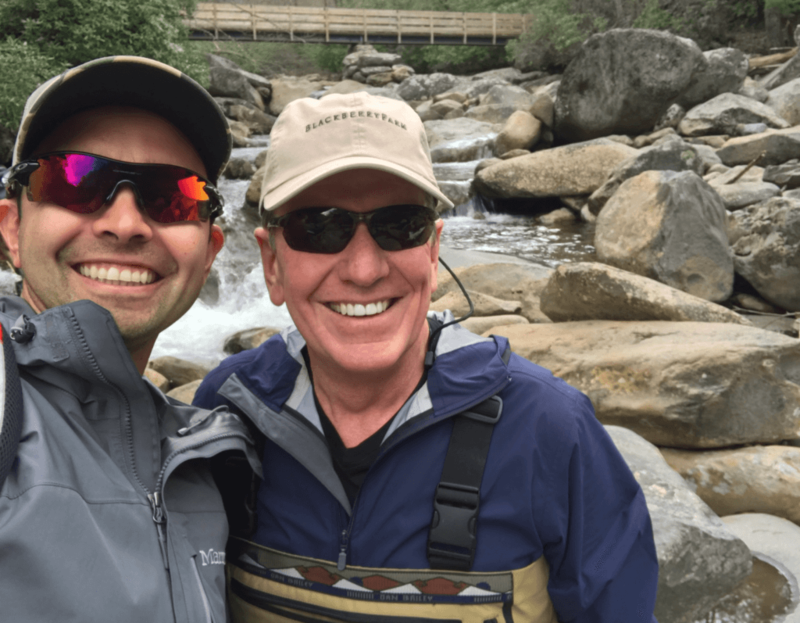 Thank you, Michael, for inviting me to this experience, giving me time to reflect and meditate, and for being my new fly fishing buddy! To finish up, please make sure you sign up for the waitlist for Smart From Scratch if you have yet to start your online business. Enrollment opens on June 5 so you can finally get the instructions, guidance, and accountability you need to find your own winning business idea. Click here to sign up for the Smart From Scratch waitlist!